In many respects, the historical trajectory of the Russian economy during the twentieth century has been a terra incognita until now. As for the official statistics, there are at least three important reasons for this. First, many relevant indicators were either not measured or were kept secret and never published. Second, Russia (as the RSFSR) was a part of the USSR, and statistics for the RSFSR was much less prevalent than for the USSR as a whole (historical changes of the Russian borders also require special consideration). Third, an ideological dogma existed about the absence of inflation in the planned Soviet economy; therefore, all deflators (if any) were underestimated, and all aggregates in constant and/or comparable prices were overestimated (as were the corresponding growth rates). As for the unofficial historical estimates, most of them were focused on the USSR, not on the RSFSR. It’s very risky to use them as a proxy for historical indicators of the Russian Federation. Our second aim was to denote periods of growth and contraction in the Russian economy and to reveal the economic factors that caused changes in trajectory. Periods of contractions during the era of the planned economy were of special interest for us. We found that recessions had occurred, not only in the market but also in the planned Russian economy (of course, with a significant remark that contractions in the planned economy were much rarer but evidently more destructive). 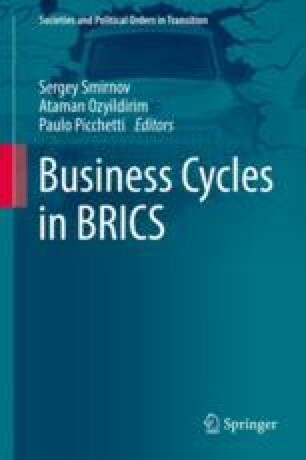 This chapter is an updated version of the earlier article: Smirnov S. V. Economic Fluctuations in Russia (from the late 1920s to 2015). Russian Journal of Economics. 2015. Vol. 1. No. 2. P. 130-153. The author is grateful for nonprofit partnership “Redaktsiya zhurnala ‘Voprosy Ekonomiki’” for permission to republish it. Support from the Basic Research Program of the National Research University Higher School of Economics is also gratefully acknowledged. The sources for each indicator are placed in a table—one table per indicator; there are also some methodological comments, if necessary. The information stored in the RSEA was initially “secret” or “top-secret,” but since 1956, the same indicators have been published in official statistical yearbooks. The official index of industrial production (1960 = 100) is in fact not fully official. We calculated it using official Y-o-Y percent changes (if available) or Y-o-Y percent changes that, in turn, were calculated using official base indices (with various bases) or values of industrial production in list prices (also with various bases). We took 1960 as a base to have a time-series comparable with the alternative index of industrial production. We added together the total number of cattle, sheep, goats, and pigs. Almost continuous time-series, beginning with 1927, are published in only one source; more recent and fully comparable data may be taken from the CBSD held by Rosstat. The “holes” for almost 90 years are 1928 and 1938. We succeeded in patching the hole in 1928 and substituted the average of 1937 and 1939 for 1938. According to the present methodology (in use since 1953), the garnered grain is counted (at the granary at net weight). According to the “old” methodology, the harvest is estimated in the field (standing grain). It’s not a surprise that the “old” methodology gave higher numbers than the “present”; it’s a surprise that, according to Rosstat, for 1928 and 1932, both methodologies gave equal volumes. Therefore, one may doubt if Rosstat’s re-estimations for the 1920s and the 1930s were made in a proper way; in practice, it also means that one can’t use “old” data to interpolate the “new.” For this reason, we preferred to use both time-series in parallel (one for the “present” methodology, another for the “old” one). The grain area planted was counted by the Soviet statistical system beginning in 1925. This indicator is more or less comparable through time. Some minor problems were connected with two factors: (a) the changes of the RSFSR’s borders (as a rule, these problems were easily solved, as the relevant regional information was usually available); and (b) with corn grain of milky-wax ripeness, which was included in total grain for several years in the second part of 1950s, and excluded for all other years. To handle with this bug we had to make our own estimates of this factor for 1956–1957 using information for the USSR as a whole; the correction was around 1.5% of the total area planted in the RSFSR. Historical information on residential construction is less available than on other sectors of the Russian economy, at least those considered here. Publication of the RSFSR’s data on new residential completions began in 1946; we couldn’t find any older information, even in unpublished documents stored in archives. Our hypothesis relates this to the fact that the main goal of economic policy during the Soviet period was the creation of large-scale industrial establishments, especially those which were specialized in producing machines and equipment (capital goods). The Communist and Soviet authorities paid far less attention to the production of consumer goods and to residential construction (it even seems that for years, the Soviet statistics simply didn’t count the new houses built by collective farmers, which were the majority of the houses in rural areas). As the official figures for total new residential construction consist of different components for different years, we decided not to use them at all. Instead, we chose three time-series: one for state organizations and establishments (it’s roughly comparable for all years) and two for the population, for workers and employees up to 1980, and for the total population beginning in 1980 (we hope that the trajectories of the latter two are similar). Railroad statistics for the RSFSR was openly published up to the mid-1930s and after 1958 with the more than a 20-year gap in between. We found almost all of the necessary information in unpublished documents stored in archives. Unfortunately, at the moment we still have three holes: 1934 and 1936–1937. It makes it impossible to say anything reasonable about the dynamics of railroad freight transportation during the second 5-year plan (1933–1937), but it’s enough to detect the contraction in 1933.